The Duchess of Cambridge debuted what appears to be another piece from The Queen's jewel collection at the Anna Freud Centre Gala Dinner this evening, the Diamond Quatrefoil Bracelet. The wide diamond bracelet features multiple diamond quatrefoil motifs, the four-lobed design popular in architecture, art, heraldry, and elsewhere. Each quatrefoil outline is filled with five individual diamonds. This bracelet is not a well-known member of the royal collection and it's easy to mistake for other bracelets, such as Queen Victoria's Bracelet. The quatrefoil-motif bracelet was worn by the late Queen Elizabeth The Queen Mother; it may have been another treasure from the Greville bequest. 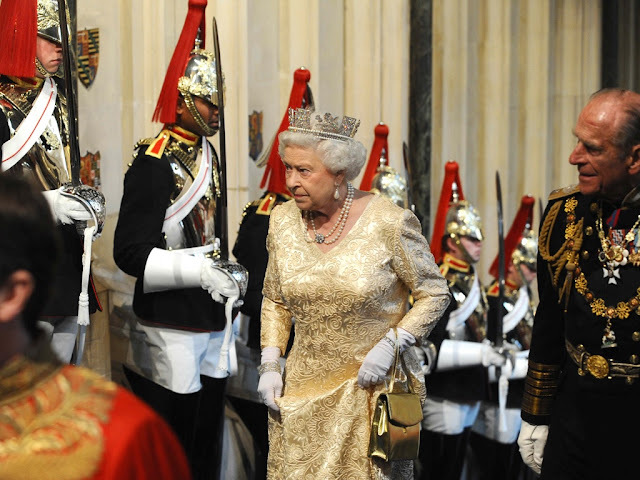 It then went to The Queen, along with the rest of The Queen Mother's jewels on her death in 2002. The Diamond Quatrefoil Bracelet now appears to join The Duchess of Cambridge's growing pile of jewelry borrowed from The Queen, as Her Majesty continues to increase her loans to family members. Kate's been particularly lucky in the bracelet category, also having worn the Wedding Gift Bracelet and Queen Mary's Diamond Bar Choker Bracelet. The earrings she wore at the gala are also on loan from HM, the Diamond Pendant Earrings, and this is probably their best match yet. With thanks to Franck for pointing out The Queen's use of the piece, and to Beth at the RJWMB for spotting it on The Queen Mother.